Data is the new currency of business, the most critical asset of the modern organization. In fact, enterprises that can gain business insights from their data are twice as likely to outperform their competitors. Nevertheless, 72% of them have not started, or are only planning, big data activities. In addition, organizations often spend too much money and time managing where their data is stored. The average firm purchases 24% more storage every year, but uses less than half of the capacity that it already has. Virtualizing storage with Storwize helps make new and existing storage more effective. Storwize includes many functions traditionally deployed separately in disk systems. By including these functions in a virtualization system, Storwize standardizes them across virtualized storage for greater flexibility and potentially lower costs. Storwize functions benefit all virtualized storage. For example, IBM Easy Tier® optimizes use of flash memory. In addition, IBM Real-time Compression™ enhances efficiency even further by enabling the storage of up to five times as much active primary data in the same physical disk space. Finally, high-performance thin provisioning helps automate provisioning. These benefits can help extend the useful life of existing storage assets, reducing costs. Integrating these functions into Storwize also means that they are designed to operate smoothly together, reducing management effort. 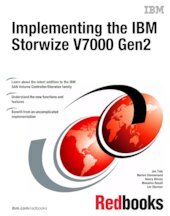 This IBM Redbooks® publication provides information about the latest features and functions of the Storwize V7000 Gen2 and software version 7.3 implementation, architectural improvements, and Easy Tier.